I have attached the Desert public golf course reviews, and descriptions. Our Desert from Palm Springs to Indio is world famous as one of the most popular golf vacation destinations in the America. The truth is that our Desert is referred to as the "golf capital of the world," with more than 125 golf courses, great weather and natural beauty adding to the area's popularity as a top golf & vacation location. October is the over seeding time so many courses are closed, but come November the gorgeous green fairways are something to see. 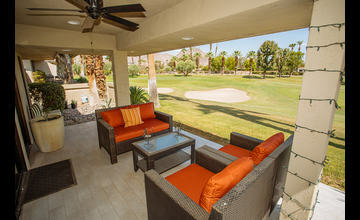 Rates of course increase during the high season, but there are so many courses and so many possible deals through GolfNow, Stand by Golf, Palm Springs Tee Times and in the Desert Sun and the local Golf Magazine that you will enjoy the beautiful “walk in the park” golfing experience beyond your dreams. This 18-hole golf course is open to the public and is available at affordable rates. Escena's Palm Springs Golf Course offers beautiful mountain views of the spectacular Palm Springs Desert area mountain range from every hole. Lush landscaping and thousands of palm trees make this course feel like a paradise. 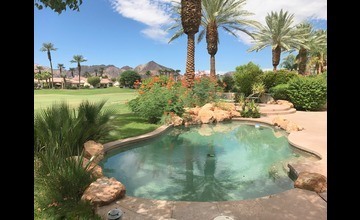 Water concourses throughout this golf course offer a surprise for your senses of both sight and sound and you play golf in this quiet desert golf oasis. If you have a special event or a group of friends you'd like to host for a golf trip dinner, Escena's dining room is available for rent for small events or business meetings. 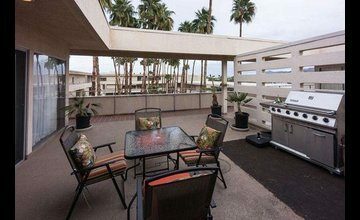 The clubhouse and bar's outdoor patio that overlooks the Escena Golf Course and the mountain vistas is an excellent location for a re-cap of the day's golf with friends and family. This course offers 7,211 yards of golf from the longest tees for a par of 72. Escena Golf Course was designed by Jack Nicklaus. Also, while bunkers protect many of the undulating greens, most offer collection areas that dramatically improve your chances to save par. With generous fairways and four sets of tees to select from, each golfer can decide his or her own personal level for challenge. This is a fun Jack Nicklaus designed golf course with fantastic views. I have played this course many times and always come back and enjoy. 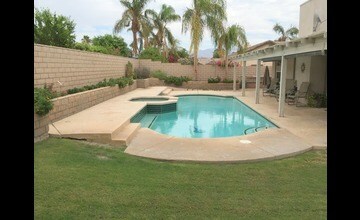 Mesquite Golf Course is centrally located less than ten minutes to downtown Palm Springs. The course at Mesquite Golf and Country Club features five lakes and many large trees lining the fairways. The mountain views of the San Jacinto Palm Springs mountain range are gorgeous from this course. Mesquite Country Club has hosted several local PGA and Golden State Tour events. Though this course is relatively short by championship standards, playing 6,400 yards from the tips, Mesquite Golf Course offers a challenging golf game with numerous water hazards. Moderately rolling fairways with washes that are playing factors. Some holes are very close together, so be alert. Bermuda greens. The 18-hole "Seven Lakes" course at the Seven Lakes Country Club facility in Palm Springs, California features 2,712 yards of golf from the longest tees for a par of 58. Designed by Ted Robinson, ASGCA, and the Seven Lakes golf course opened in 1965. An excellent golf course with Ted Robinson trademarks of water and scenic holes, punctuated by stunning mountain views. Greens are well protected by bunkers. Rolling fairways Bermuda greens. Surrounded on three sides by breathtaking, colorful, natural mountain vistas, sheltered from the wind and nestled at the base of the San Jacinto Mountains lies the jewel of the desert, Indian Canyons Golf Resort. 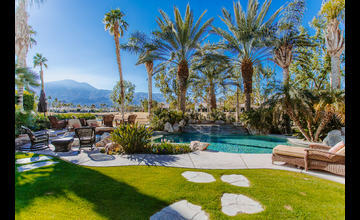 This 36-hole resort is uniquely positioned to offer you an unrivaled golf experience in the Greater Palm Springs Area. The South Course is an 18-hole championship course that was redesigned by Casey O'Callaghan in 2004 along with consultant, Amy Alcott, LPGA Hall-of-Famer. This par 72, 6,582-yard championship course has four large lakes that come into play on six of the holes, but the most extraordinary feature is the 5 five par holes. The course also features rolling mounds and fairways and more than 850 palm trees, including some 500 Washingtonian filifera palm trees native to the Agua Caliente Tribe and an important tree in the history of the Tribe. The North Course is a par 72, 6,943-yard course that was designed by well-known architect, William P. Bell and is heavily steeped in tradition. 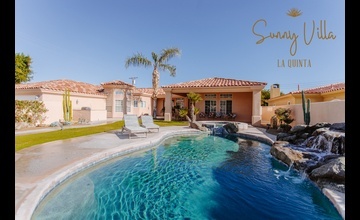 This classically designed course meanders through Palm Springs' stylish "Canyon" region, which boasts a wide array of authentic mid-century modern homes and stunning mountain views. The course is brought to life by thousands of palm, olive and other native trees. The course has six challenging water hazards the largest which is located between the 9th and 18th holes and hosts the course's visual centerpiece, the historic Walt Disney fountain which shoots water jets over 100 feet high. I have played both these wonderful golf courses and you will not be disappointed. 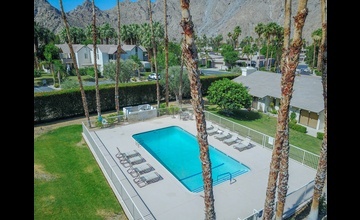 Established in 1944 as a private non-profit club, The O'Donnell Golf Club is located mountainside west of the heart of beautiful downtown Palm Springs, California. 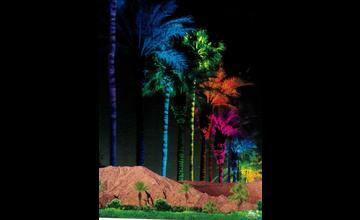 O'Donnell Golf Course is the oldest golf course in the entire Greater Palm Springs California Desert area. O'Donnell uniquely combines challenging golf with a casual, relaxed back-in-time atmosphere, transporting you to a place in time when things were simpler and less hurried. Special trial/seasonal offers for seasonal residents and Vacation Palm Springs guests who may be interested in sampling O'Donnell prior to joining. For information, please call O'Donnell Golf Club manager Sally at (760) 325-2259. 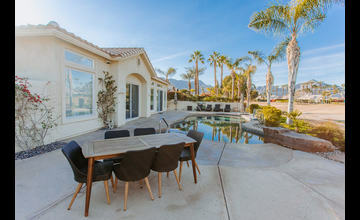 Please mention Vacation Palm Springs guest special offer when you contact Sally. David Rainville, who has specialized in California golf courses and boasts one of the most spectacular courses in the Coachella Valley, designed the Cathedral Canyon Golf Club at Welk Resorts Desert Oasis. Renowned golfer Billy Casper assisted Mr. Rainville in the design. Amazingly well designed course that works though all the great views of the desert. The Pebble Course: Are you are looking for an 18 hole round in 3 hours and have plenty of energy left to enjoy the rest of the day, the Pebble course is for you. This course offers 17 chances to make a hole in one. With a much friendlier rating of 54.6, the Pebble Course totals 3,020 yards in length. The only Gary Player course in the desert and it is so much fun. Tough but fun course that I have always enjoyed. The 18-hole "Woodhaven" course at the Woodhaven Country Club facility in Palm Desert, California features 5,827 yards of golf from the longest tees for a par of 70. The course rating is 67.3 and it has a slope rating of 120 on Bermuda grass. Designed by Harold Heers Jr., the Woodhaven golf course opened in 1984. 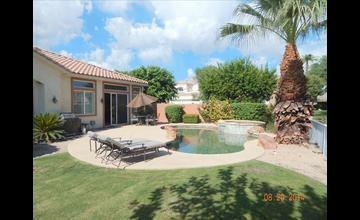 Woodhaven is a private country club that is considered one of the best-hidden gems of the desert. The golf course was designed with gentle rolling slopes, narrow fairways, with spectacular mountain views throughout the 18 holes. Fabulous tight course that will test all your golf shots – I should know I have lost a few balls here. Awarded 4.5 stars by Golf Digest magazine, Desert Willow is another multicourse facility that offers a top-rated golfing experience. The Mountain View course is a 6,913-yard, par-72 classic California venue with long, uneven fairways that integrate indigenous California flora and fauna into the field of play. The more challenging Firecliff course, while a bit longer in total yardage (7,056), is a much more difficult play with more than 100 bunker and hazard areas, and tough shots such as the par-3, 14th hole that requires precision placement from the tee to a sunken green with bunkers on two sides. 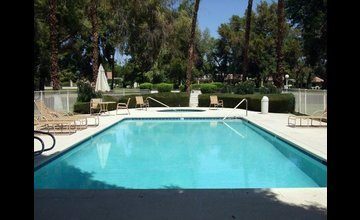 Desert Willow Golf Resort located in Palm Desert, California, just minutes away from Palm Springs, offers two of the Coachella Valley's best plays. Test your skills against the natural hazards and myriad water features of the challenging Firecliff Course or play a smoother, more relaxing round on the magnificent Mountain View course, which boasts newly renovated bunkers and greens. Its award-winning championship golf in One Legendary Location, on Two Unforgettable Courses. Played both courses and can only say they are two of the finest courses in the desert and I would say in California. 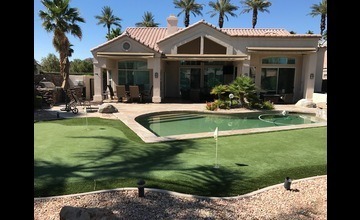 Unlike other courses, the Shadow Ridge, which was designed by championship golfer Nick Faldo, does not try to incorporate the desert terrain into the field of play. The course at Shadow Ridge boasts lush fairways and greens bordered by more than 2,000 trees and shrubs. The course itself is an 18-hole, 6,900 yard, par-71 venue formed in a sideways, lazy figure-8 design. In 2010, Shadow Ridge was chosen by Golf Magazine as one of the top 30 places to play in California. Difficult yes, but playing the only Nick Faldo course in the desert is something special. If you are visiting from out of the area and are looking for a local secret, visit Mountain Vista Golf Club at Sun City Palm Desert. 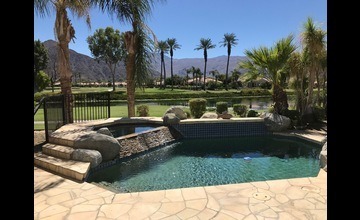 You can scour the valley and find courses in Cathedral City, Palm Springs, Rancho Mirage or even La Quinta but if you want to play a challenging course with extremely well maintained greens at an exceptional price, look no further. 36 holes of Championship Golf, designed by golfing Legend Billy Casper, are open to the Public 7 days a week. My favorite course – a true Arnold Palmer design that was built for the “Bob Hope” and you will never be disappointed. This is one of the finest golf courses, private or public, in the desert, let alone the United States. Indian Wells Golf Resort’s two beautiful courses have been ranked among the top municipal courses in the country. The higher rated of the two courses is the Players Course, which is an 18-hole, 7,300 yard, par-72 venue that has hosted such tournaments as the 2008 LG Skins Game. The Celebrity Course has views that are breathtaking and equally highly rated nationally and statewide as one of the most beautiful and enjoyable golfing experiences. I have played both Indian Wells Golf Resort Courses and love the views; the texture of a gorgeously manicured course and it is hard to believe with the staff, the golf shop, the restaurant and the courses that you are playing a municipal course. Private clubs feel through and through. What can I say about two of the most amazing golf course in the Country let alone the desert – a must play for both courses. Another Arnold Palmer designed course that challenges every shot you have – but what a course to play. Simply a wonderful walk in the park. I have played all the PGA Courses and it is truly a golfers Paradise to behold. Directions: Take the Indio Boulevard/Jefferson Street exit off Interstate 10 (I-10 East) and drive south to the end of Jefferson Street to PGA Boulevard. Follow PGA Boulevard to the Stadium Clubhouse. The only Greg Norman course in the desert and you will not want to miss it. I love this course and it is used in the “Bob Hope” of today PGA Tournament. This is one of the true fun courses regardless of your handicap. There may be no greater challenge in the game of golf than the PGA West TPC Stadium Golf Course, designed by Pete Dye and ranked in The 100 Greatest Courses in the U.S. by Golf Magazine. The original home of the Skins Game, the PGA West TPC Stadium Course has been viewed by millions on TV. The ultimate challenge awaits you at this "see it to believe it " golf course. Packed with pot bunkers, sand, water and side hill lies. One of the PGA West TPC Stadium course highlights is on the 16th hole, a 571-yard, par 5, where the massive green side bunker, complete with stairs, sits 18 feet below the level of the green. Bent greens. One of the toughest golf courses in the country and yet fun to play. Target golf and improves your mental game for 18 Pete Dye holes. If you can one put the 17th count the day as a complete success. 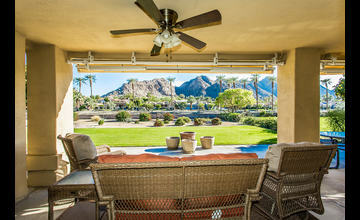 La Quinta Resort’s venues are independent and stand on their own as top-rated courses for the area. The La Quinta's Mountain course is one of those courses always rated as one of the top golf courses in the nation. The Mountain course is a 6,700 yard, par-72 field that boasts some of the trickiest holes in the game, such as the par-5, fourth hole where at the tee, the green is hidden from view by a mountain that you have to play around to get to the hole. The Dunes Course is equally challenging as a Pete Dye design. In fact this is the course made famous by David Duval when he needed to bride the 17th and 18th holes – both with large water hazards – to regain his PGA card. Both La Quinta Resort courses are not only challenging yet extremely pleasing with views and inspiring your golfing ability and yet not beating you up at the end of the round. I have played both La Quinta Resort Pete Dye designed courses and yes they are challenging, but so much fun to partake. Directions: Heading east on the I-10 freeway, exit Washington Street and make a right. From Washington turn right on Eisenhower Drive, look for the location on your right. 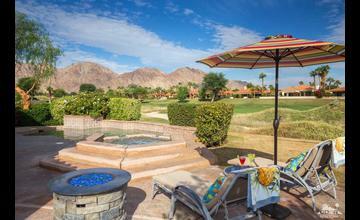 This La Quinta Resort Mountain course combines everything the desert has to offer. Many famous tournaments have been played on this legendary and exclusive " VIP players only " golfer's paradise. Noted for pot bunkers, rock formations, sand and water. Watch for the par-3 16th hole that has a green that is surrounded by desert mountain rocks. The Mountain course has been the home to the World Cup, the PGA National Cup Pro Championships and the California State Open. One of the top courses in the valley. Love this course because it is truly in the mountains and the scenery and the layout is stupendous. A great Pete Dye designed that works your shots, but does not beat you up. Always in fabulous condition. Directions: Heading east on I-10, exit at Golf Center Pkwy and turn left (towards Fantasy Springs Casino) onto Golf Center Pkwy. Turn right onto Terra Lago Pkwy, the clubhouse entrance will be approx. 1/2 mile straight ahead. The Golf Club at Terra Lago presents 36 challenging holes (North Course and South Course) the North Course features dramatic elevation changes, stunning views, and a beautiful and challenging island green par 3 which was a featured hole during the Skins Games played at The Golf Club at Terra Lago. 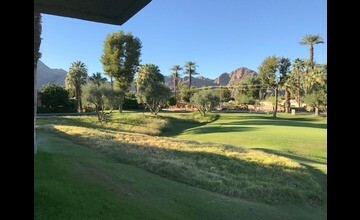 The view from the 7th tee box is considered one of the best in the valley; from there you have a complete panoramic view from one end of the Coachella Valley to the other. Both course work through the hills and there are some Par 3 holes that will really make you swing away. Fun to play both and views are great. Wow, who would guess that this far out in the desert is such a gorgeous golf course that Clive Clark designed (he also has one in The Hideaway). The centerpiece of the resort facility is our 27-hole championship golf course, which has recently undergone a three-phase revitalization process designed to modernize the facility while preserving the historic integrity of the property. Indian Palms' three nine hole courses - the Mountain, Royal and Indian nines. are designed to provide tests of accuracy rather than strength and distance. In addition, each nine offers a slightly diverse style of golf challenge, taking full advantage of its majestic surroundings, offering the perfect challenge to ignite the interest of any caliber of golfer. Throughout your round, you will come across strategically placed sand traps and water comes into play on 15 of the 27 holes. In contrast to most desert courses, hundreds of mature trees line each fairway. Our signature hole is the 301-yard par-4 5th Hole on the Mountain Nine - featuring our island green. Fun course to play open fairways make this course a must during the season. 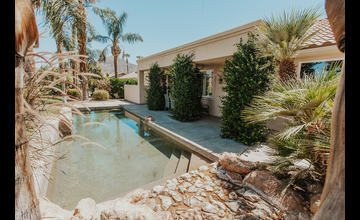 Located just east of Palm Springs is the fabulous Heritage Palms Golf Club. A true gem of the desert, this 18-hole championship Arthur Hills-designed course brings you one of the best-nurtured and more enticing courses in the valley. Designed for your enjoyment, Heritage Palms provides 6,722 yards of pure golfing pleasure. Par for the 18 holes is a 72. 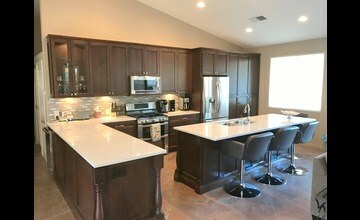 Equally challenging and rewarding, this magnificent layout is not to be missed. Heritage Palms has superb conditioning and playing surfaces. The club features an expansive 30,000-foot clubhouse with a traditional golf shop, conference center, affordable green fees, a practice facility and a spacious restaurant. This premier championship course has all the right ingredients for an exceptional day of golf. Heritage Palms Golf Course is heavily contoured with some changes in elevation. Well-bunkered and good uses of water-no two holes are alike! There are also four large lakes, and plenty of greenside bunkers. This course is one of the hidden gems in the desert – I have played the great course a few times and just keep coming back – you will love it.